Voters watch election results roll in Tuesday night at the Tippecanoe County Building. Tippecanoe County Sheriff candidate Bob Goldsmith (D) watches election results. He defeated Republican Jason Dombkowski in a tight race Tuesday night. Democrat Chris Campbell defeated incumbent Republican Sally Siegrist for the Indiana House District 26 seat. Republican Julie Roush defeated Democrat Vicky Woeste to become the new Tippecanoe County Clerk. Republican Ron Alting easily defeated Democrat Sherry Shipley to retain his state Senate seat. Partial election results are displayed in the Tippecanoe County Building Tuesday night. At one point, Tippecanoe County Sheriff candidate Bob Goldsmith (D) held just a six-vote lead over Jason Dombkowski (R). Tippecanoe County Sheriff's Deputy Bob Goldsmith (D) and West Lafayette Police Chief Jason Dombkowski (R) shake hands as they wait to see which would be named the next Tippecanoe County Sheriff. Goldsmith won by a margin of 0.5-percent. 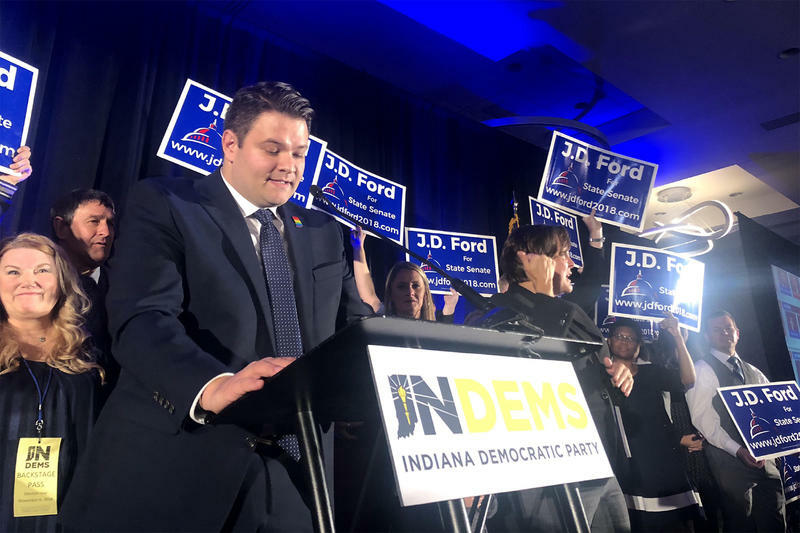 Tippecanoe County's 2018 Election Day featured the best turnout in years and saw some surprises, including an incumbent State Representative going down to defeat and a heavily-favored sheriff candidate losing. It also featured some aspects that have become all too common, including long waits for votes to be tabulated and snafus with the county's aging voting equipment. WBAA's Miyu Sumimoto shot some photos at the Tippecanoe County Building Tuesday night to document the goings-on.